We have 5 tips that will keep your new or old refrigerator running smooth and also make it work as designed for years to come. These tips are easy to manage and do not take much effort to perform. These are the most practical ways to keep your fridge running longer. 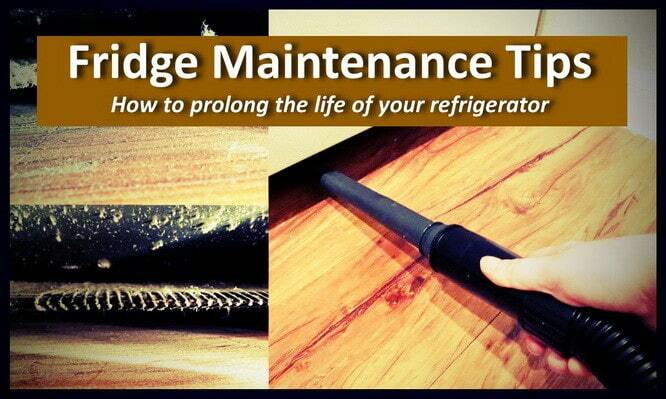 These simple tips will prevent you from having to call a maintenance repair company to come and fix your refrigerator. These tips will also help to keep your refrigerator clean. These easy maintenance tips will work on all refrigerators including GE, Whirlpool, Kenmore, Samsung, LG, Frigidaire, Maytag, and more. Setting the fridge temperature too low (extra cold) will make your refrigerator work harder to keep the temp setting. This can result in the refrigerator not lasting as long as designed. By setting the fridge or freezer temperature at a warmer setting, you will not only save money in electricity but also make your refrigerator last longer. When you turn the refrigerator setting dial to be very cold, you are adding extra running time on your fridge compressor. This can result in a failed compressor and that usually means a new refrigerator is needed. Set the temperature of your freezer and fridge at a reasonably warmer setting. 37 degrees is the perfect temperature setting in the fridge to save money in electric bills, keep your food at a the perfect temperature, and make the compressor run less. Efficiency is key when dealing with your freezer. 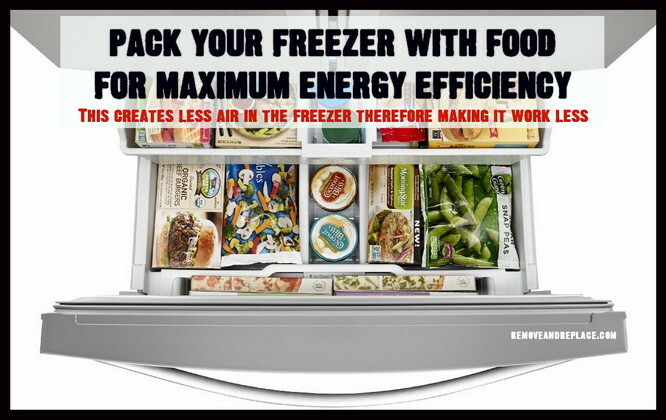 By keeping it completely full with frozen foods, the better the freezer will keep the temperature. The less air in the freezer the better. This leads to the freezer keeping cooler and less energy run time on the freezer. This means it will run less and keep items perfectly frozen. FREEZER EFFICIENCY TIP: If you do not have tons of food to keep in your freezer, add a bunch of bottles full of water to fill up space. The small 16.9 ounce water bottles that you drink everyday that you have in your refrigerator are the ones we are talking about. When you go on a road trip, grab a few frozen water bottles and by the time you want to drink them they will be defrosted. By keeping bottles of frozen water in your freezer, it creates less space resulting in your freezer not having to run as long therefore saving electricity and longevity of your freezer. When you open the refrigerator or freezer door, the outside warm air flows in and the cold refrigerator or freezer air gets out. Be conscious of how long you have the door open. If your refrigerator is messy and disorganized, find the time to put things in there place so you won’t have to keep the fridge door open for a long time. Leaving the refrigerator door open too long forces the compressor to turn on and cool the warm air that has just entered. By not leaving the door of the refrigerator open very long, you will save money. When you have warm food, let the food sit until it gets to room temperature before putting it inside the fridge. This makes it so there is a less amount of warm air inside the refrigerator. Anything hot or warm you put in the refrigerator will add warm air into the fridge and add run time to the compressor. BONUS REFRIGERATOR MAINTENANCE TIP: Keep the door seals or door gaskets clean. If there is debris or food on the door seal, cold air can escape. Check your door gaskets regularly for cracks or tears. If you find cracks or tears, remove and replace the door gasket to prevent cold air from seeping out from your fridge. BONUS MONEY SAVING TIP: An old (15 or so years old) refrigerator can use 3 or 4 times more electricity then the new efficient refrigerators manufactured today. This means that you can save possibly HUNDREDS of dollars in yearly electric bills. If your older refrigerator is falling apart and not cooling properly, buying a new one may be the best choice and will save you money in the long run. If you know any other simple methods or easy tricks to make a refrigerator more efficient, please leave a comment below to help our other readers. I really like your tip not to put hot foods in the fridge. It’s true that it warms up the fridge, putting hot food in a cold environment, especially when sealed can cause toxic and lethal bacteria to grow in the food. That in addition to the wear and tear on the fridge is not worth it at all. When it comes to my refrigerator, I usually try and keep the freezer part of it half full so that there is always room to put more things into it. I really hate it when things can’t fit in the freezer when I need it to and that is why I do that, but I had no idea that filling it up could make it run more efficiently. Now that I realize this, I think that I am going to start filling up the empty space with water bottles that I can remove when I need the space.